November 22nd, 2015 | Posted by Velda in ACUPRES.,MERIDIANS, REFLEX. 1. Take hold of your arm with the opposite hand. Place your index finger (three finger widths) above the wrist on Triple Heater 5, located in the hollow between the bones. Place the thumb (three finger widths) above the wrist crease on Pericardium 6, located in the depression between the tendons (see illustration). 2. Simply hold these two points together (firm but not tight), and breathe about thirty six (normal) breaths. Chinese Medicine teaches that this helps ward off any invasions on the Wei Chi (protective chi). Repeat on the opposite arm. 1. 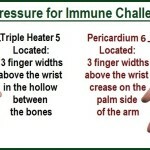 Rest wrist in the fingers of the other hand and use the thumb to locate and apply pressure to Triple Heater 5 (see location above) for 30 seconds to 1 minute. 2. Breathe deeply and visualize good circulation and balance throughout the upper, middle and lower areas of the body. Repeat on the opposite arm. Benefits: It promotes good circulation and balance. 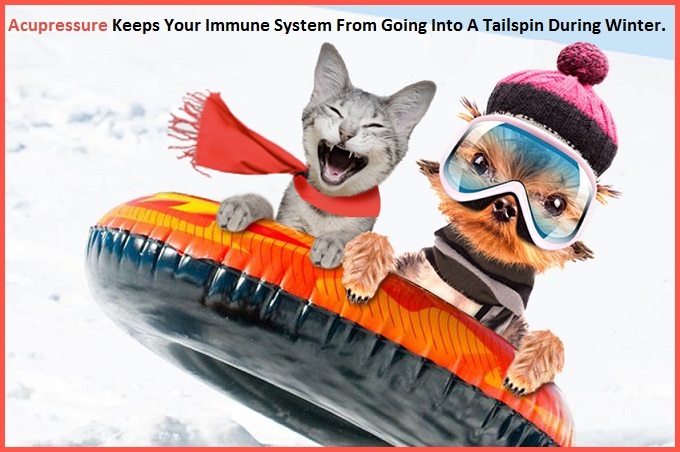 Triple Heater 5 can prevent or relieve fevers, headaches, ear problems, and pain in elbows, wrists or fingers. 1. 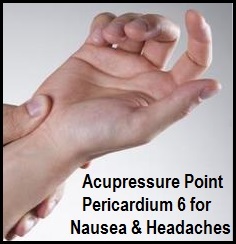 Rest wrist in the fingers of the other hand and use the thumb to locate and apply pressure to Pericardium 6 (see illustration in photo). 2. If this area is tender, massage and stimulate the area 4-5 seconds. To relieve nausea, press and hold the point for 3 minutes or longer. Repeat on opposite arm. Benefits: Relieves nausea, upset stomach, flu, morning sickness (it’s safe to use during pregnancy), motion sickness, carpal tunnel syndrome, and headaches.